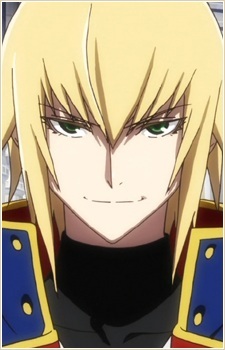 Jin Kisaragi is a Major in the NOL, and one of its elite commanding officers. He is always cool and calm, but is also jealous, ambitious, and possessive, with little care for others, treating them like they are mere obstacles. He displayed formidable actions to gain his rank during the Ikaruga Civil War. When he heard that Ragna the Bloodedge had arrived on the scene, he quickly abandoned his post to hunt him down by himself. He was adopted into the Kisaragi house, a highly powerful and respected family within the NOL. He possesses a notable psychosis, said to be caused by his sword, the Nox Nyctores "Yukianesa." While the sword grants him manipulation over ice, it also enhances primal feelings and is often blamed for "insanity." The truth, however, is that Ragna is Jin's biological brother, and Jin's early feelings of rivalry were furthered by his visions of the future and his Nox Nyctores' amplification of his emotions. Terumi caused Jin's mind to hack off Ragna's arm (later nearly dying without the intervention of Rachel) and Jin often says that he's looking forward to killing Ragna again. He is shown in one of Nu's paths to have actually seemed caring to Saya (until Nu stated her name), perhaps meaning Terumi's influence might have started even before the incident that drove the brothers apart. During one of the time-loops, Ragna and Jin's battle is interrupted by v-13's appearance and she ends up throwing herself along with Ragna into the Cauldron. Never wanting to lose his brother again, Jin jumps into the Cauldron despite his wounds and is thrown back into the past, where he meets Rachel Alucard and is offered a chance to be a true hero. From this point on, Jin becomes one of the Six Heroes, Hakumen. During the True Ending, Jin is incapacitated badly by Ragna and is sent to the hospital. When he awakes, he finds that he is being targeted by NOL for assassination, thus runs away from the hospital and goes into hiding while cutting off all ties with the Kisaragi family. However, he also hears about Ragna and his subordinate Noel Vermillion staying together, and as Noel reminds him very much of Saya, Jin decides to attempt to kill them out of jealousy. Over time, his willpower becomes strong enough to resist Yukianesa's influence, thanks to the help of Jubei. Jin assisted Hakumen to defeat Mu, but neither had any success. He, Ragna and Noel found that Hazama is working for their sister Saya and Tsubaki sided with them, which is a shock to him. After they left, he, Ragna and Noel decide to become stronger and finding what the true motive is. Jin is currently training under Jubei, possibly to better control Yukianesa.